It's the most wonderful time of the year, isn't it? The Christmas TV movies have already begun airing. I've started my tweets (@TisTheSeasonTV) and daily postings on the Facebook page Tis The Season TV making suggestions for viewing--calling them SET YOUR DVRs. The viewing options during November and December each year can get a little overwhelming. Let me update you with the details of where to find the best holiday programming for 2017. The Hallmark Channel releases more new Christmas TV movies each year than any other network in the industry. 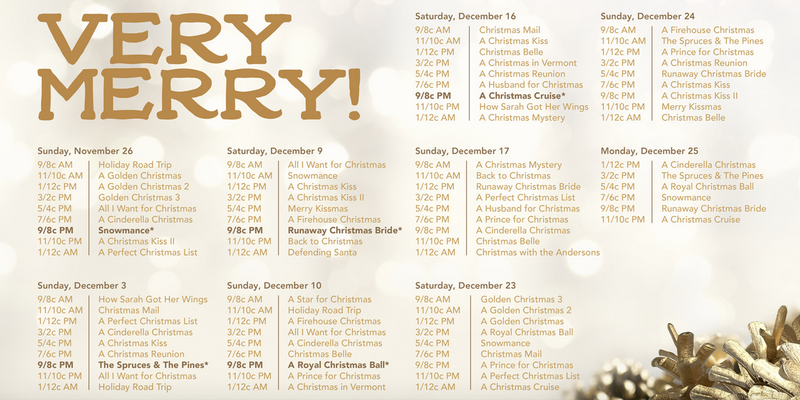 For many Christmas TV movie fans, the Hallmark Channel is the network schedule to check first. With good reason, in 2017, Hallmark will be airing more than 20 new Christmas TV movies alongside many classics from their archives. If you didn't already know, the movie marathon has already begun--it started Friday, October 27th--and continues all day and all night through the end of December. They typically debut their new holiday movies on Saturday and Sunday nights. 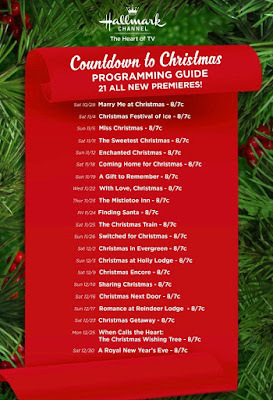 HERE'S the link to the list of Christmas TV movie premieres. 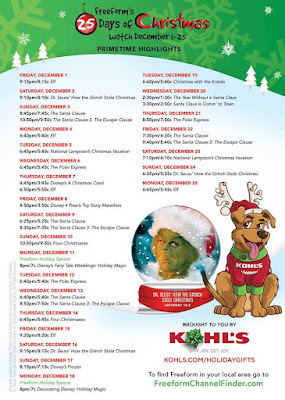 The daily schedule of their holiday movies can be found on their website HERE. 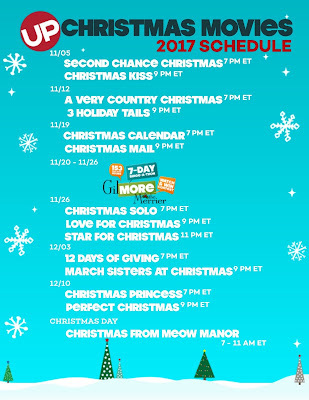 Complete list of 2017 Hallmark Christmas movie premieres. Click on image to enlarge. 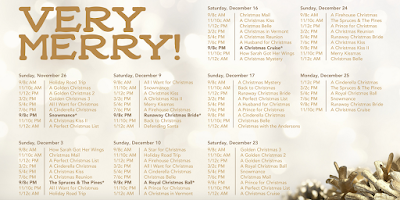 Complete list of Hallmark Movies & Mysteries 2017 Christmas movie premieres. Click on image to enlarge. 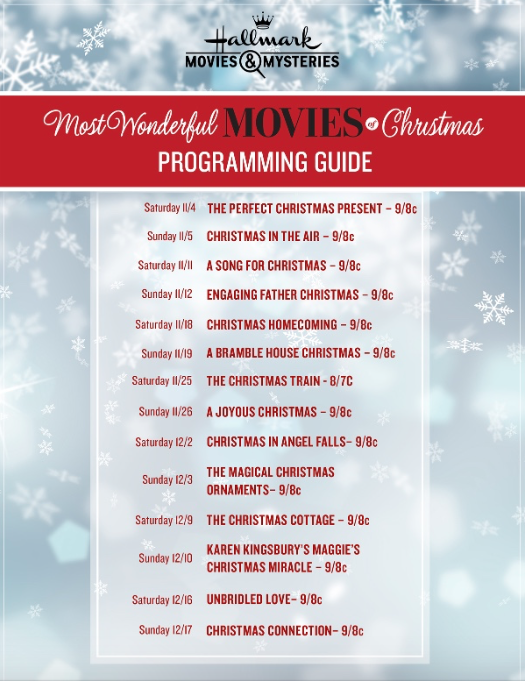 Hallmark's sister channel--Hallmark Movies and Mysteries--also airs new Christmas TV movies and older classics. 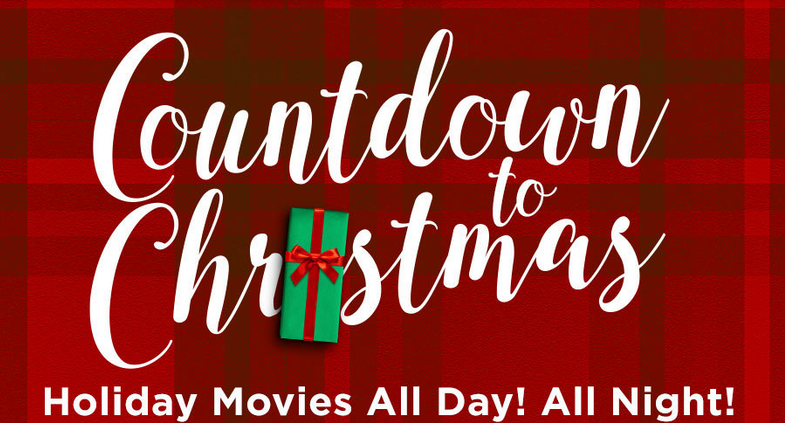 In fact, the older holiday movies they broadcast are pulled from a deeper archive so this is the place to see some of your older Hallmark Christmas TV movie favorites. 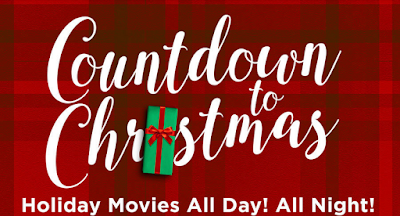 This is the fifth year that HMM is premiering their own new Christmas TV movies--this year they have thirteen new movies. Click HERE for more about HMM Christmas movies. 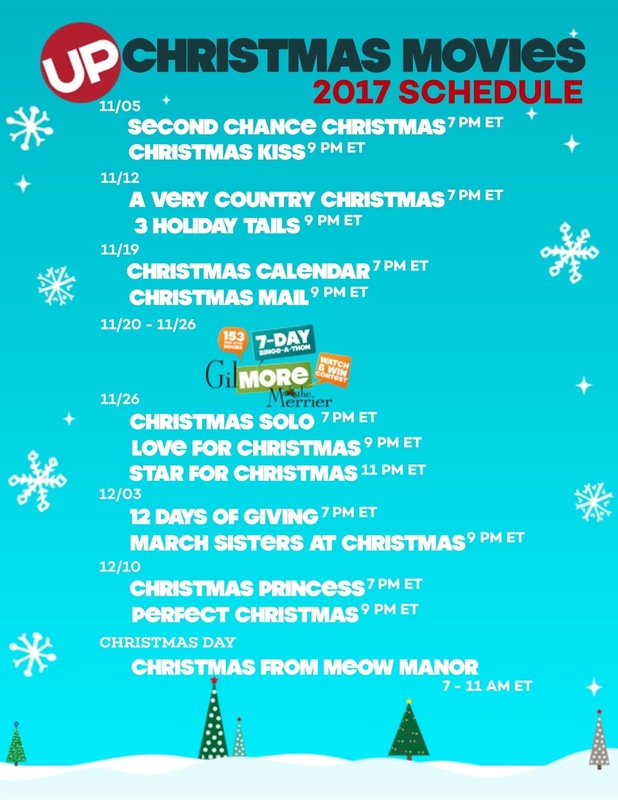 And, just like the Hallmark Channel, HMM has already begun their holiday programming--which will continue through the end of the holidays. 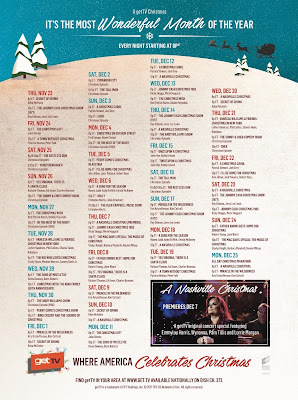 Click HERE for the link to the complete HMM Christmas movie schedule. 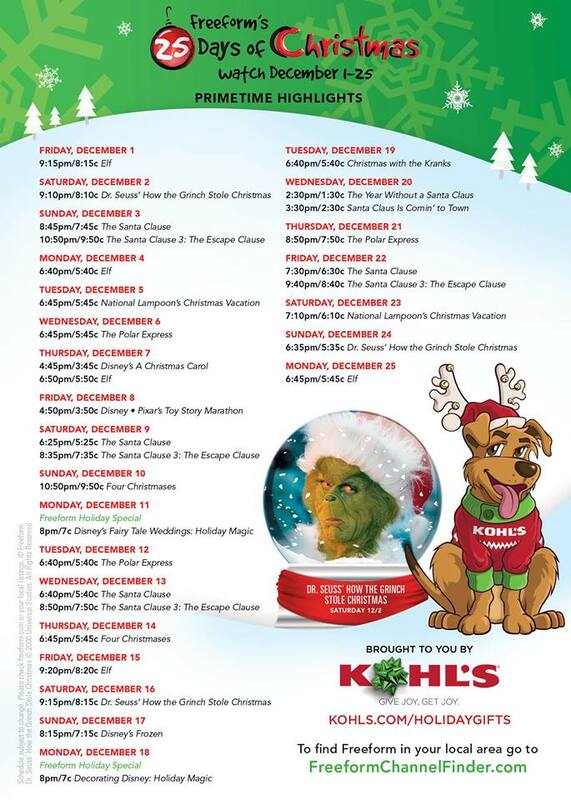 The schedule highlights of the 25 Days of Christmas on Freeform. Click on image to enlarge. Freeform (formerly known as ABC Family Channel) is another major source of holiday programming every year. But I didn't need to tell you that, right? We're all familiar with their marathons of Christmas animation, Christmas movies, and family-friendly entertainment. Freeform's 25 Days of Christmas programming marathon begin Dec. 1st, however their holiday programming has already begun. Click HERE for the daily schedule. They have three new debuts this holiday season: the original movie Angry Angel which first airs on Nov. 27th, Disney Fairy Tale Weddings: Holiday Magic on Dec. 11th, and Decorating Disney on Dec. 18th. 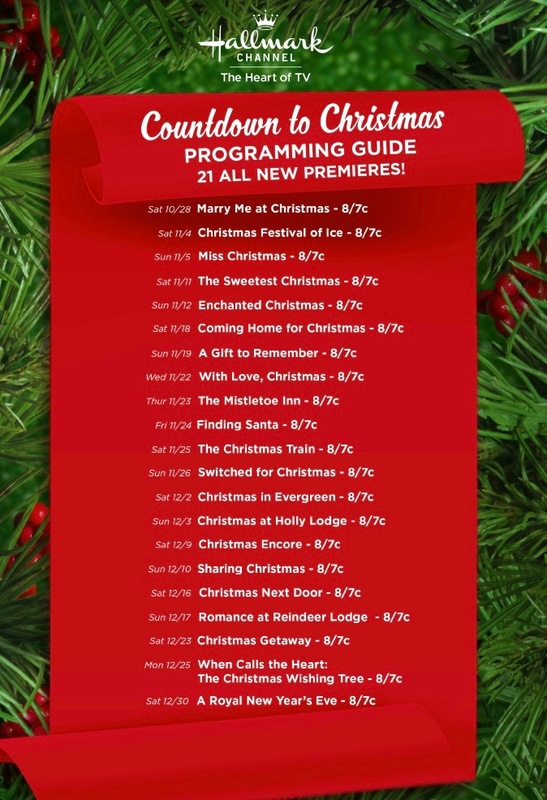 New Lifetime Christmas TV movies begin Nov. 25th. Lifetime is debuting eight new Christmas TV movies in 2017. I know, right? Those new movies will be airing on Saturday and Sunday nights. Click here for more info about each of those. UpTV holiday schedule for 2017. Click to enlarge. UP Network also debuts new family-friendly Christmas TV movies, as well as showing older favorites too. This year, the schedule looks exciting. Of these movies, many are new ones. For more about the UP Network Christmas programming, click HERE. 2017 movie guide for Ion TV including premieres. Click to enlarge. 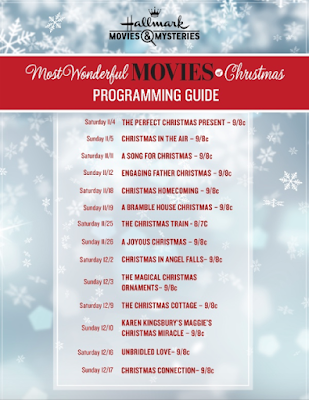 ION Television's schedule is filled with holiday movies too. Look for those on Saturday and Sunday nights. This year, they are debuting five new Christmas TV movies as well as airing favorites from the past. Click HERE for the complete schedule. The 2017 schedule of GetTV Christmas programming chock full of vintage variety specials! Click to enlarge. But one of the MOST EXCITING holiday programming schedules has to be GetTV. They have pulled out all the stops again this year! 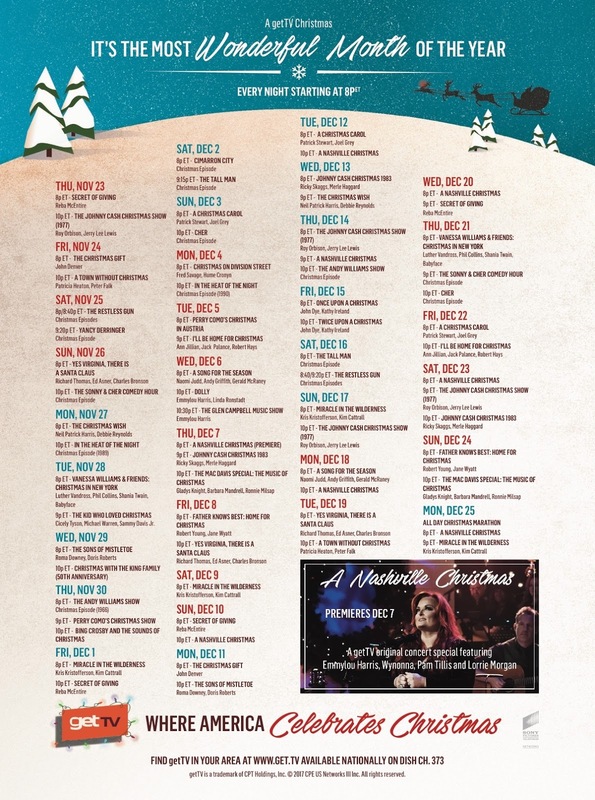 What I'm most looking forward to watching are A Nashville Christmas special, four classic Perry Como Christmas specials, the Mac Davis Christmas Special, the Johnny Cash Christmas music specials, Glen Campbell Christmas special, and the Father Knows Best Christmas TV movie reunion. GetTV is also airing Christmas episodes of nearly forgotten TV westerns. There's so much good stuff on their schedule, I'm overwhelmed--and you should be too. This is an abundance of riches. Check out the full GetTV holiday schedule here. Me TV offers Sunday afternoon marathons in 2017. Me TV is rolling out their retro programming's Christmas installments on Sunday afternoon marathons throughout the holiday season. Here's the schedule of episodes for the Sunday marathons. However, if you just peek at their daily schedule, you can see an abundance of holiday episodes there too. Not quite sure why their not promoting it? I guess you can follow along with me on Facebook and Twitter at @TistheSeasonTV where I'll highlight the more fun and rare ones. Antenna TV, another retro programming network, is planning a Christmas Eve and Christmas Day marathon of holiday episodes from their current classic TV line-up. That should be fun. NBC's live concert event is always a good one! Of course, the major networks have their holiday programming as well. 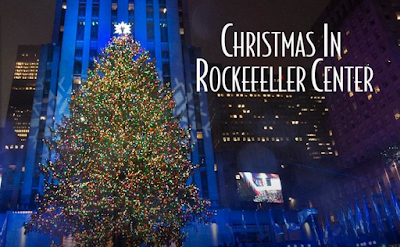 NBC is already promoting their 20th annual Christmas in Rockefeller Center concert for Wed. Nov. 29th at 8pm(ET). NBC will also be airing Dreamworks' Trolls Holiday Special at 8:30pm(ET) on Friday, Nov. 24th. That new animated special based on the film characters should be exciting. 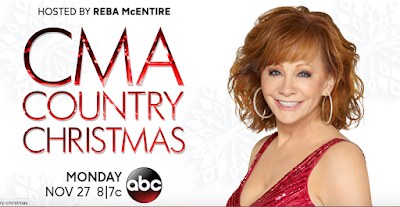 ABC is once again airing the variety special CMA Country Christmas. This year's concert has a new host: Reba McEntire. It airs Monday, Nov. 27th, 8pm(ET). CBS is airing the animated classics Rudolph the Red-Nosed Reindeer, Frosty the Snowman, Frosty Returns, and The Story of Santa Claus again this year. Look for Frosty and Frosty Returns on Friday, Nov. 24th. And, Fox is airing the live musical experience of A Christmas Story: the Musical. Matthew Broderick has been cast as the narrator, and Maya Rudolph as Mrs. Parker. This should be fun! It airs on Dec. 17th. Have you seen a staging of this musical before? 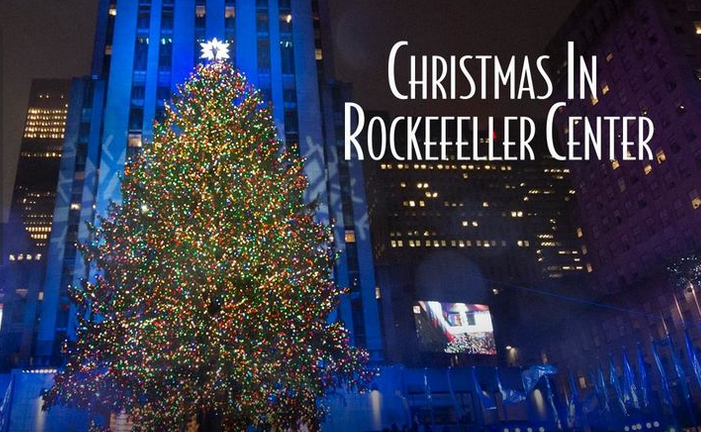 Stay close to my social media links for more announcements about fantastic holiday programming. If you'd like reminders of the new Christmas TV movie debuts and other exciting holiday TV programming, don't forget to follow my Facebook page Tis The Season TV and/or my tweets at @TisTheSeasonTV. 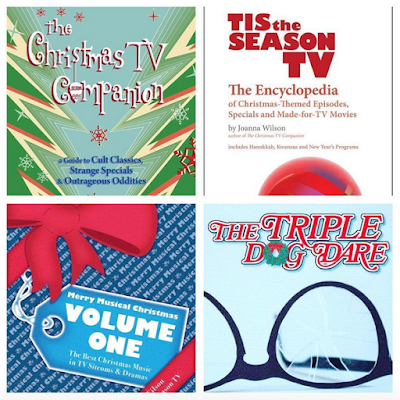 Where on the metaphorical television dial do you watch your favorite Christmas movies and specials? Feel free to share in the comments below. Cleveland Christmas celebrity photo bomb! See the person entering the gate to A Christmas Story House behind me? What an adventure I had yesterday! 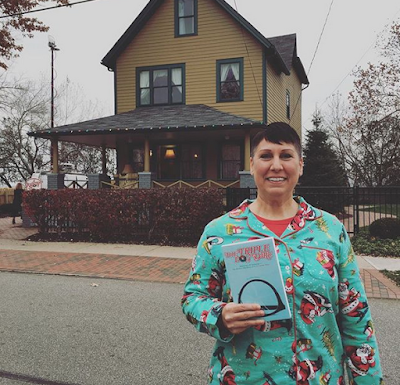 Cleveland, Ohio TV news anchors from Fox 8 News slept overnight at A Christmas Story House on Monday, Nov. 13th. Early Tuesday morning, they broadcast their morning show live from the living room of the House. Luckily, they invited me to join them to talk about my latest book Triple Dog Dare. 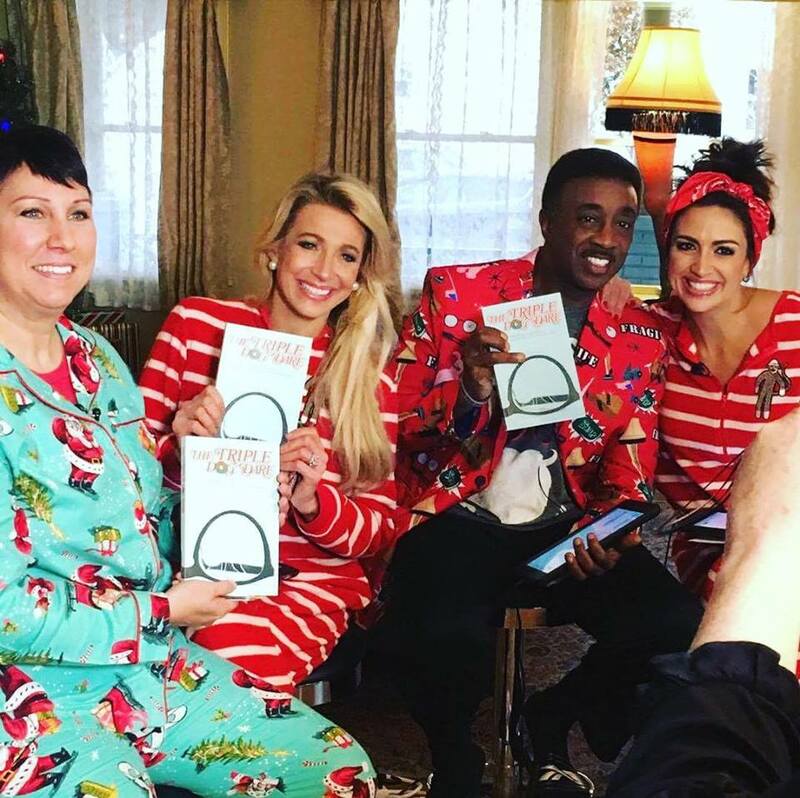 Since this was the morning show, I decided to join them in my Christmas pajamas. It was so much fun! Photo courtesy of Fox 8. 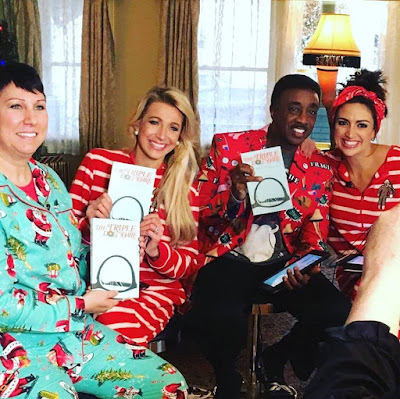 On the Christmas Story House front porch, from left to right: Wayne Dawson, Kenny Crumpton, Stefani Schaefer, Kristi Capel, and Scott Sabol. After my live interview as I was leaving the House, I bumped into actor Patty Johnson. She played the hysterically funny mean elf that drags Ralphie up the stairs to visit with Santa Claus. Johnson was on her way into the House to join the Fox 8 anchors just after me. We exchanged pleasantries and I directed her to the back door entrance. I knew they were waiting for her, so I didn't want to hold her up by asking for a photo. I was also a little star struck! How awesome is it to bump into one of the movie's cast? I was very pleased to sign copies for each of the anchors. This is just a fun way to roll out the archives and I hope you'll enjoy it. Today on Tuesday 70s I have already shared my discussion of the 1977 Christmas episode of the sitcom Three's Company. I'm looking forward to exploring these lively categories. 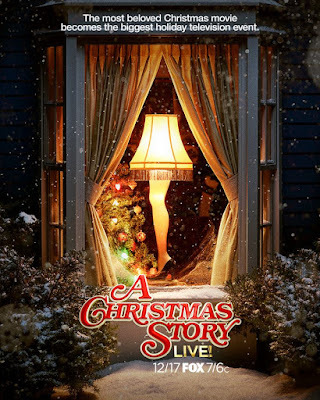 --Each day on Christmas TV History, I'll also be sharing a video link to a Christmas-themed episode, special, or movie. The funnest links are the rare, hard-to-find programs from the past. Look for one each day. --I'll also post a link to the new essays I write throughout November and December, just like I usually do. You can expect a new essay on Seinfeld and its invention of Festivus coming soon. Follow along on the Facebook page to see what comes next. As always, if you skip a day on Facebook, just scroll down the Christmas TV History page wall to see what you missed. --Each day I'll be posting a Yuletide Memory of the Day as usual however, these are selected from the best of my archives and won't duplicate the daily links from Christmas TV History on Facebook! Yeah--I have a large archive. --I'll also be making daily suggestions called Set Your DVRs on upcoming TV programs to look for in your TV listings. 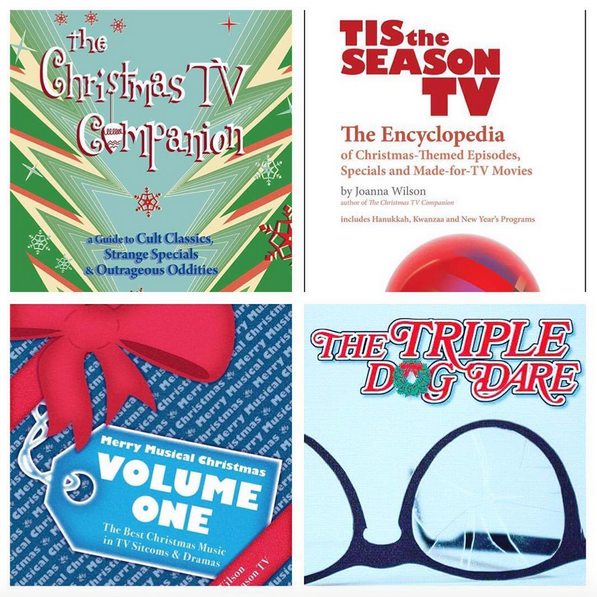 If you don't watch broadcast/cable/or satellite TV, you could look for these programming suggestions on-demand, or streaming on Hulu, Netflix, Amazon, on DVD at your local library, or by whatever means you enjoy holiday entertainment. --I'll be making updates about my latest book, its contents, events & book signings, and more. --I'll be sharing the same content (in 144 characters or less) as above. Follow me if you don't already. I'm also on Instagram as @TistheSeasonTV--you're welcome to follow me there too. Feel free to follow any or all of these networking locations--and join the conversation. Social networking is about being social so please feel free to share your favorite memories from these programs or ask questions. If you change your mind and don't want to follow my posts, just change your notifications or unfollow. It's that simple. And, if you aren't seeing the daily posts from these facebook pages as you like, go to the home page and make sure you're receiving notifications. If you comment, like, and share the posts--this increases the page's visibility in your newsfeed. Again, if you miss any of the daily posts, go directly to the page wall and scroll down to see what you missed--like, comment, and share to see future posts. Let me know if you have any questions. If you'd rather go through this website's archives yourself (independently of social media links) PLEASE do so--feel free to use the SEARCH BOX and type in any title you'd like. If you're on a computer, the search box is located at the top of this website on the right hand side. If you're on a mobile device, scroll to the bottom and hit view web version--and you should see the search box again at the top on the right. If I haven't written about your favorite Christmas episode, special, or movie yet on the website, let me know--maybe I'll cover it soon.